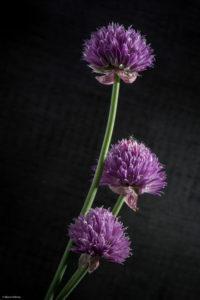 A year ago, I bought a small pot with chives herbes at our local supermarket. I didn’t need all of it and decided to plant it in our garden. 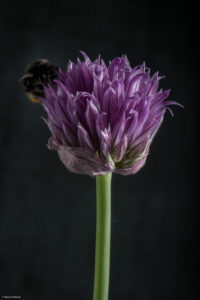 Now, a year later, the chives plant survived the winter without any problems and had grown up big time. 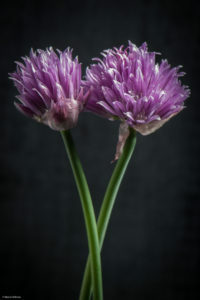 A few weeks ago, flowers in a lovely purple color grew on the tops of the chives stalks. Every time I passed by them, these nice purple coloured flowers appealed to me. I like them a lot and in the back of my head grew a plan to make some images of them. leave the chives plant alone and bring the studio gear out. I checked the weather forecast which indicated a bit cold day without rain. Perfect for shooting outside! So I choose option 2 and brought the studio gear outside. To create these images I used two spot-like studio flashes with a pretty directional light. One flash to light the flower and another to light the background. The reflector was needed to fill in some light at the left side of the flower(s). As a background I used a small, dark toned, wooden tray.